Rottnest Island is one of Australia’s smallest inhabited islands – it is 11 kilometres long and 4.5 kilometres at its widest point. 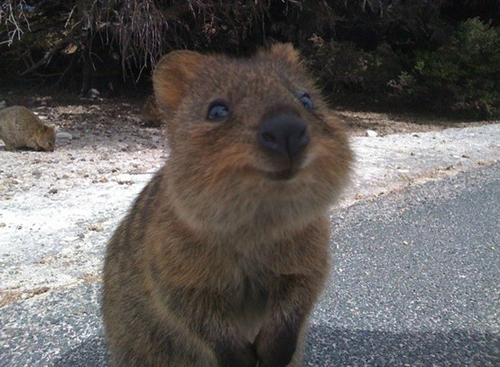 The island is twenty kilometres off the coast of Perth. The island’s Salt Lakes are a natural phenomena unique to Rottnest. The lakes are grouped in the north east section of the island and are named Government House Lake, Serpentine Lake, Herschell Lake, Garden Lake and Lake Baghdad. Because of natural seepage, there are many pools of fresh water and it is estimated that here, you’ll find half the total wildlife on the island. Known to the Aboriginal people as Wadjemup, which is thought to mean “place across the water,” Rottnest Island was observed by various Dutch sailors from 1610, including Frederick de Houtman in 1619, and the three ships Waekende Boey, Elburg and Emeloort in 1658, but it wasn’t until 1696 when Dutch explorer Willem de Vlamingh landed here and named it “Rotte-nest” meaning rats nest, a reference to the wallaby-like animals on the islands called Quokkas. Other explorers who stopped at the island included members of the French expedition of Nicholas Baudin in the Naturaliste and the Geographe in 1801 (when he planted a flag and left a bottle with a letter) and 1803, Phillip Parker King in 1822, and Captain James Stirling in 1827. They commonly reported that much of the island was heavily wooded, which is not the case today. In 1830, shortly after the establishment of the British Swan River Colony at nearby Fremantle, Robert Thomson settled on the island with his wife and seven children. Thomson developed pasture land west of Herschel Lake as well as salt harvesting and refining from the several salt lakes which was then exported to the mainland settlement. Salt was an important commodity before the advent of refrigeration. Eight years after Robert Thomson arrived, ten Aboriginal prisoners were sent to Rottnest Island. 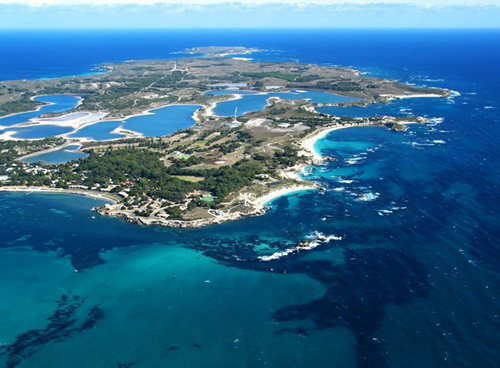 Except for the period 1849 to 1855, Rottnest was used as an Aboriginal prison until 1931. It has been estimated that there may be as many as 369 Aboriginal graves on the island. A total of some 3,700 Aboriginal men and boys, from all parts of the state, were imprisoned during that time. During World war I, Rottnest was used as an internment camp, then a place for salt gathering before the military installations on the island today were built during during World War II, when Rottnest became an internment camp again. The installations can be seen by taking a train to tour the gun emplacements and tunnels on Oliver Hill. In 1880 – 1901 the island housed a Boys Reform School. Boys were sent there for petty crimes such as stealing cakes or giving cheek to the Police. From 1838 – 1903 there was also an Aboriginal Prison on the Island. The Quad housed 180 prisoners at one time, all aboriginal. Over the 65 years it was opened, the quad housed 3600 prisoners, and 10% of those prisoners died. Hotel Rottnest, affectionately called the “Quokka Arms” was the summer residence of Western Australian governors from 1864 to 1912. Built between 1858 and 1864, it became a hotel in 1953 and has been extensively renovated in recent years. 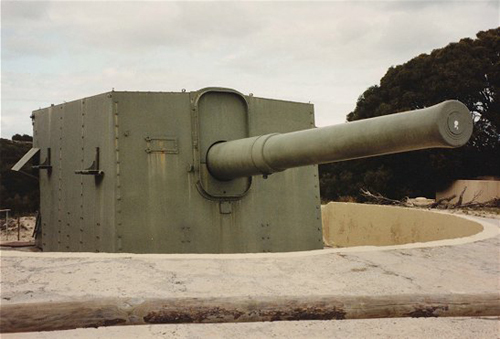 I was contacted by the team conserving and restoring the WWII coastal defence batteries at Rottnest Island. They were trying to determine the British Standard colours that were available from 1938-42 and match these to some of the remaining colour left on the 9.2 inch gun. 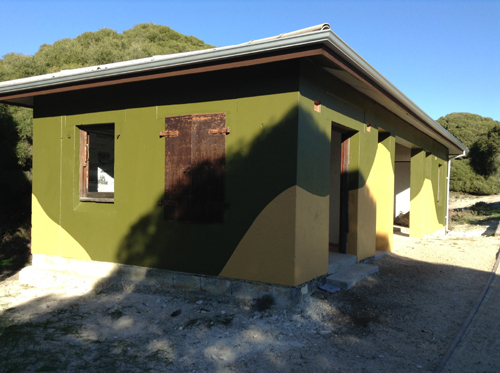 From experience gained on earlier projects on wartime buildings and command posts I was able to recommend BS Deep Bronze Green. The camouflage colours used on the buildings was another requirement and I steered them towards the wartime camouflage range and, in particular, two colours – Shade No 4 and Shade No 7. Although long since out of production I produced correlations for them. The BL 9.2 inch guns Mk IX and Mk X were British 46.7 calibres naval and coast defence guns in service from 1899 to the 1950s. They had possibly the longest, most varied and successful service history of any British heavy ordnance. To see this gun in action there is a British Pathé film. With thanks to Harriet Wyatt and the team at Rottnest Island.